The FDA has approved use of a Merck drug in combination with chemotherapy as a first-line treatment for the most common type of lung cancer. The FDA approval for (NYSE: MRK) pembrozlizumab (Keytruda) to treat metastatic nonsquamous non-small cell lung cancer widens the use of the immunotherapy. Last year, the FDA approved it for lung cancer patients whose tumors produce a high amount of the protein PD-L1, which covered only a fraction of the total cases of lung cancer. The Merck drug, a so-called checkpoint inhibitor, blocks the signals that some cancers use to evade attack by the immune system. Wednesday’s FDA decision approves a combined use of pembrolizumab and the chemotherapy pemetrexed (Almita) to treat lung cancer patients whether or not their tumors express PD-L1. There are more than 200,000 new cases of lung cancer each year in the U.S., and it is the leading cause of cancer death, according to the American Cancer Society. In a research note, Evercore ISI analyst Umer Raffat wrote that the FDA approval expands the market opportunity for Merck. But that market won’t open up right away. Depending on the age of the patient, some physicians may approach combination therapy differently, Raffat wrote. He added that early adoption of a combination treatment would probably occur with physicians who already treat their patients with pemetrexed. “It’s not a pent-up demand,” Raffat wrote. The FDA granted accelerated approval of the combination after a study in 123 patients showed it had an effect on 55 percent of them, nearly double the effect in the pemetrexed-only group. Among patients treated with the combination, 93 percent showed a response to the drug for six months or more, compared to 81 percent of patients treated with only chemotherapy. The study also was based on the patients’ progression-free survival, which is a measure of time after treatment that a patient lives without the cancer worsening. Median progression-free survival was 13 months in the combination treatment group, compared to 8.9 months in the chemotherapy group. Pembrolizumab is also approved for certain kinds of skin cancer, head-and-neck cancer, and Hodgkin lymphoma. While the market for checkpoint inhibitors has grown, some companies have stumbled with their drugs. Though Genentech, the South San Francisco-based unit of Swiss pharma giant Roche, received accelerated FDA approval for its atezolizumab (Tecentriq) last year to treat the most common type of bladder cancer, the company announced Wednesday that it failed a Phase 3 study in more advanced forms of the disease. Meanwhile, Bristol-Myers Squibb (NYSE: BMY) saw its checkpoint inhibitor nivolumab (Opdivo) win FDA approvals in skin, lung, and kidney cancers, as well as one form of Hodgikin lymphoma. But last year, while pembrolizumab was moving ahead in previously untreated lung cancer, nivolumab failed an important late-stage study in those patients. 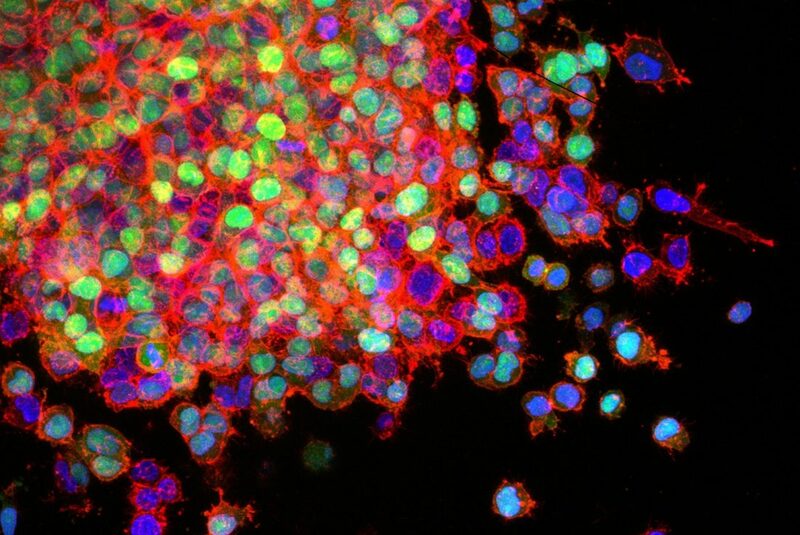 Image by the National Cancer Institute.